← What’s All the Buzz? I am an agent of change. I am a force to be reckoned with. Forget all of that psycho babbling. I am a man with a constant craving and have learned that some diversity in my diet is not a bad thing. Who am I kidding? I love food, and you know this already. Ethnic restaurants and eateries have always been the topic of Chicago Alphabet Soup and that is not going to change. But I wanted to take ethnic dining one more step farther — ethnic dining with a fusion twist. With so many fantastic restaurants in Chicago, what better place to delve into a mixture of cultural cuisines than in any of the many dining establishments in the city. A very short walk from my downtown office is Vermilion, located at 10 W. Hubbard Avenue. Situated in what could be mistaken for a brownstone between a notch-up sports bar and a cigar bar, is one of Chicago’s premier fusion restaurants. 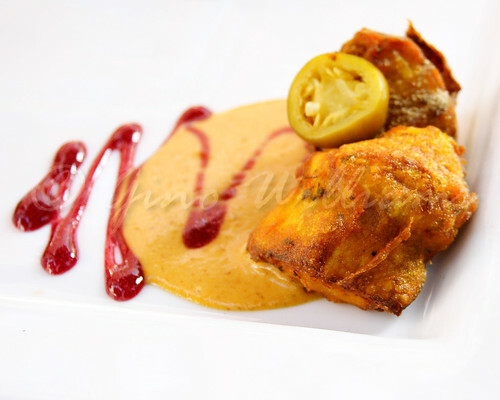 Vermilion blends the flavours of Indian and Latin influences. It is an interesting combination, rather appetizing when done right, to have two very competitive flavours prepared in the same dishes. During visits from years long past, the chefs seemed more influenced by Indian spices and so Indian was dominant in the dishes. I wanted to see if that still was the case. With it being half past five o’clock, the restaurant was not yet filled. I had a pick of any seat, but I opted to sit outside and enjoy the warm temperatures. Much to my chagrin, I had forgotten about the cigar bar immediately next door. But it was outside where I had to sit because photography on the inside was not an option allowed. Nothing like sitting outside after work hours in the middle of River North watching the Barbies, Kens, Ramones, and Melissas walking along their way, so coiffed, so tanned, so stiff, so perfect, so plastic. Not only was I going to get great shots of food with natural light, but I had all the trappings of a Stanley Kubrick style Normal Rockwell setting before me. I began with a cranberry juice for a cocktail. No alcohol so soon after taking a seat, as I am a lightweight and probably would have ended up calling my past room mate blabbing all sorts of things into her voice mail and then having her recount them to me during emotional blackmail. It is always better to start off light, eat something, and then introduce the heavier drinks after gobbling some solid food. When the waitress came to take my order, aside from me staring at her because she looked so much like fashion model Helana Christensen, I simply told her that I wanted a range of appetizers — or tapas as they are listed on the menu. I explained that I am vegetarian primarily, but not one of those who would make a scene if meat is served to me. My request was that she surprise me. And surprise she did. I had vindaloo arepa, chicken kabab, garbonzo beans with mint water, and artichoke pakoras. 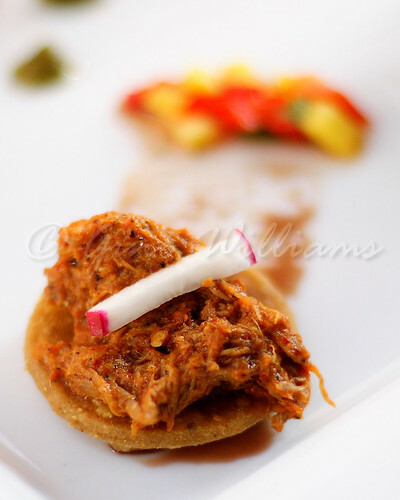 The vindaloo arepa was prepared proper with the vindaloo. Here is where blending Venezuelan arepa bread with shredded beef in a vindaloo sauce with a faint hint of mint makes for a fantastic combination. This little lovely was a taste, literally, and would be lovelier as an entrée. 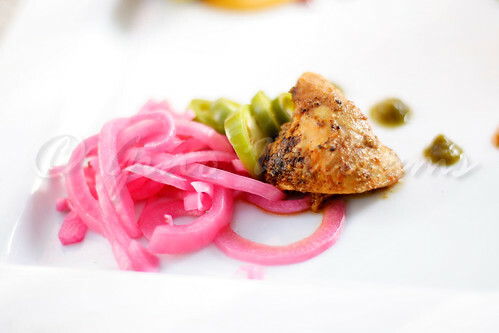 Next up was the chicken kabab with jalapeños and pickled onions. Yet another bite, so to speak, the chicken was seasoned but very mild at the same time. The onions and peppers carried most of the flavour, which may have been the Indian representation of the dish; hence, the spiciness in the vegetarian portion. The Tenth Wonder of the World — in my appetite universe — was the garbonzo beans with mint water. Too bad it was chi-chi size. 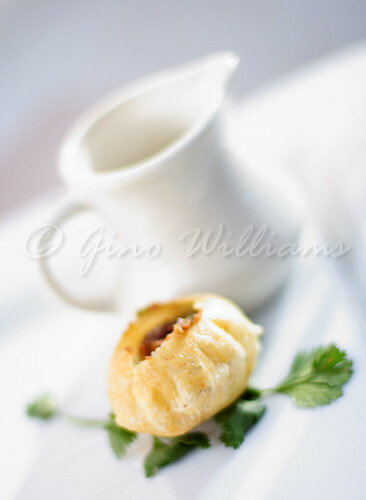 The garbonzo beans were in a small, flaky pastry, which was almost cracker-like. Served with the mint water, it was a perfect bite, one I wish I could have made last forever or at least for a few minutes. This is another one that should be an entrée, but it was fantastic as an appetizer nevertheless. Rounding out the tapas were artichokes cooked with a light flaky crust for the pakora and served with a curry gravy and a tamarind chutney drizzle. A mild flavour, but not as faint as the flavour of the chicken kabab, the mouth did not go wow with each bite but I did smile with satisfaction. Because I had my high-end camera out and on the tripod clicking away, there were several pedestrians who stopped and watched with a fair share of mock interest. It is not every day that you see a photographer out with heavy duty camera equipment capturing impressions of food. That is usually reserved for some food stylist and photographer who operate in a studio or in a kitchen away from casual strollers. Add to it all me scribbling on my notepad and there was interest. The waitress was more accommodating, albeit she was fantastic as a server long before I extracted my camera, pen, and notepad. The hostess made several rounds by the table. Other staff members came out to inquire if I was enjoying the food. And I still would not tell them that I was not a high-end reviewer for some popular magazine since I had to sit outside due to photography inside being a no-no. It was clear after the nth staff member came out and inquired as to my level of satisfaction that I realized the two sitting across from me — Mona and Rachel, I shall call them — were not pleased with not receiving the same exaggerated attentiveness. Considering how many cocktails they imbibed, they deserved attention more than I did, and muzzles for their mouths that let a lot of their personal business fly about the outdoor area. After finishing the appetizers and having my plates cleared in advance of me ordering main dishes, I requested a recommendation from the waitress for a cocktail. Having eaten something, I could have a drink and not fear that I would somehow call my past room mate and blab random nonsense. 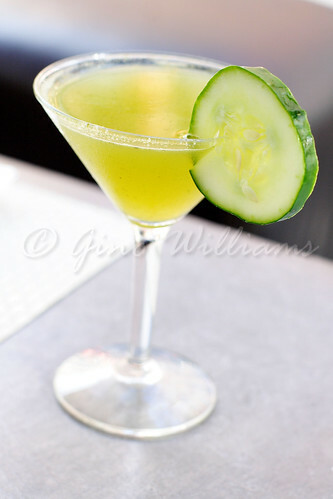 The waitress suggested that I should try a cucumber mint martini. I am one for trying all sorts of exotic and eccentric things, but this one was for the record books. I am addicted — not as in I am going to rush back to the restaurant when I am done with this review and order two for good measure. Cucumber and mint together seem rather odd and having those two flavours swimming around in vodka seems a bit eye-raising. But this was a martini that I shall have again if ever I return to Vermilion, or I will request it at other restaurants — with hopes that the bartenders do not look at me like I am a multi-headed hydra. I could taste the ingredients and the fact that the vodka was tamped down so that it did not send me into a post haste drunken buzz made it that much better. For the entrées, I wanted another range of dishes because I knew that the portions are small enough to keep your stomach from growling for about an hour but not enough to shut up any angry rumbling for longer than that. Again I gave the waitress carte blanch as I told her that I wanted mostly vegetarian but also would be open to a chicken dish. Out came a plate of choley, Pindi butter chicken, daal makhani, rice, raita, and naan. The Punjab choley was tasty and spicy, but the amount of cloves used in the dish was overpowering. To balance out the cloves, I ate the dish with the rice and naan. The Pindi butter chicken was milder than what I remember in the past. Then again, the past chef had a love for restaurants in London and Indian restaurants are the rage there for those who love flavourful food. Hearty gravy with a nice amount of spices, the marinade on the chicken was apparently too light to give pop to the chicken. A good complement to the Pindi butter chicken would have been some coconut rice. The highlight of the entrées was the daal makhani. Talk about outstanding! 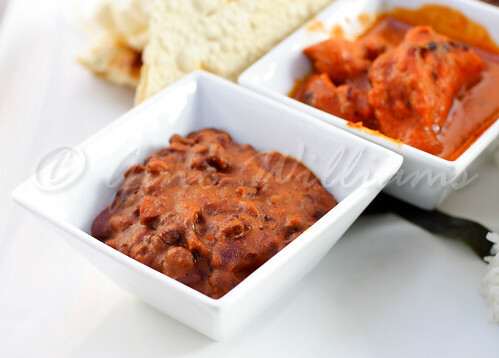 This dish was more like a rajma in a thick gravy. And being able to taste the cheese of the makhani as a hint rather than as a primary flavour made the daal makhani my most loved dish of the evening. It took me quite a while to come to the decision to blog Vermilion because of the reason I had given before about it being a restaurant that indulges fusion. 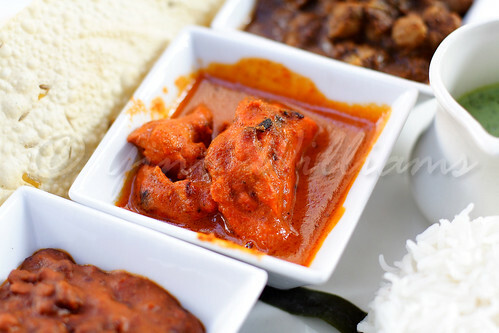 I cannot classify the cuisine specifically as Indian and I cannot classify it by any particular Latin country. There are others in the city — Sushi Samba Rio, Aria, Mexique, and Red Light, just to name a few — but I will still need to keep to authenticity of a specific ethnic cuisine. Over time I will add other restaurants like Vermilion to the site as special highlights. As to Vermilion, it is a high-end restaurant, so you will pay a high-end tab for your dining experience. 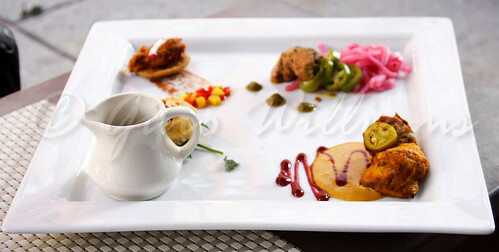 The food is delicious, but you will have to be open to multiple flavours in your dishes. River North may have its share of tourist traps, sports bars, lounges, and mannequins with pocketbooks. Yet there are some magnets in the area that attract those with appetites for finer foods. 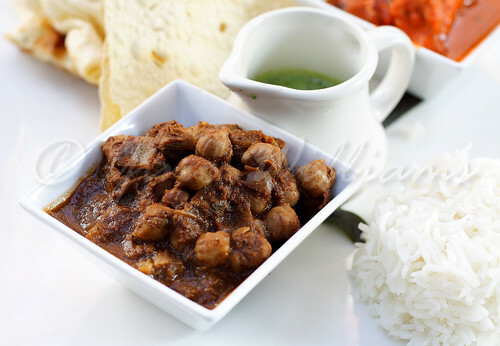 Let Vermilion be the pull that leads you to a table for some Indian and Latin food happiness.